← Is it Legal to Keep My Limit Plus My Friend’s Fish? 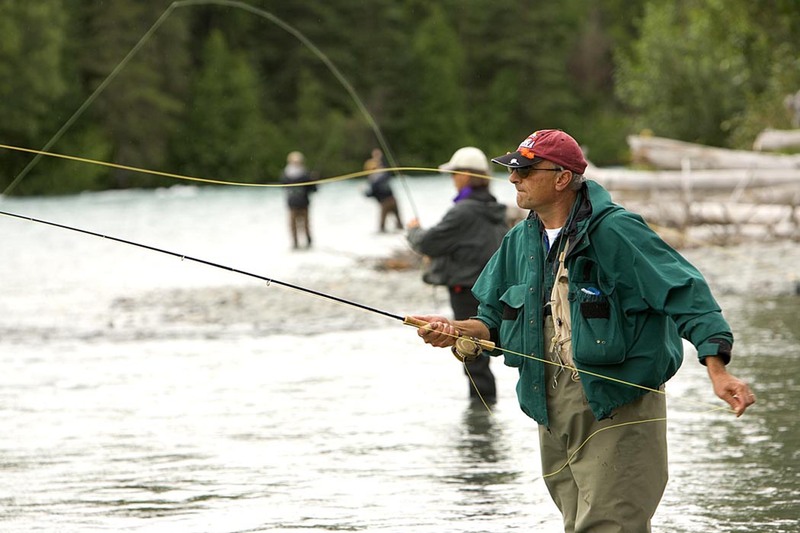 Even if regulations on various stretches of the same river differ, anglers may never exceed the daily bag or possession limit for the location where they are currently fishing, regardless of where the fish was caught (U.S.F.W.S. photo). Question: What are the bag limits for waters that have special regulations for trout? In some cases, specifically the middle fork of the Stanislaus River, the river is broken down into sections. For example, from the Beardsley Dam down to the Spring Gap Bridge there are certain restrictions and the bag limit is two fish of at least 14 inches. From the same bridge down to New Melones Lake there are no special restrictions and the bag limit is two fish. Answer: You may not exceed the daily bag or possession limit for the location where you are currently fishing, regardless of where you caught the fish. In your example, the daily bag limit is two fish, and you cannot exceed that limit on the same day even if you fish multiple segments of the river. For an alphabetical list of waters with special fishing regulations, see California Code of Regulations Title 14, section 7.50. In the current California Freshwater Sport Fishing Regulations booklet, they can be found beginning on page 30. Answer: Combination rifle/shotguns used to be fairly common and are making a bit of a comeback. According to Department of Fish and Game (DFG) Lt. Todd Tognazzini, they are legal to carry as long as the method matches the species being hunted. If the person is hunting for a species where the use of the rifle or shotgun is restricted or not permitted, they may not have ammunition for the restricted barrel. For example, if a person is hunting turkey with a 12 gauge shotgun using No. 2 shot, but they also have .22 caliber ammo in possession, this could result in a citation. Hunting with these combo guns also restricts the hunter to one shot. For example, if shooting turkeys with the shotgun barrel, the hunter would have to reload another shotgun shell if they missed or needed a backup shot. If the other barrel is being used for anything except small game, lead restrictions would apply. And if hunting in the Condor Zone, lead restrictions would also apply! Answer: Saltwater mussels may only legally be taken by hand and there is no size limit, but only 10 lbs. of mussels in the shell may be taken each day. By law, mussels may be taken year-round, but the California Department of Public Health (CDPH) monitors and annually quarantines the take of mussels for human consumption to prevent cases of paralytic shellfish poisoning and domoic acid poisoning. The quarantine is usually in effect from May through October. Before you go, check with CDPH for daily updated information on quarantines and naturally occurring shellfish toxins by calling their Shellfish Biotoxin Information Line at (510) 412-4643 or toll-free at (800) 553-4133 or by checking online at www.dfg.ca.gov/marine/healthadvisory.asp. This entry was posted in Bag Limits/ Possession, Decoys, Firearms/Ammunition, Fishing, Freshwater Fishing, Saltwater Fishing and tagged ammunition, firearms, freshwater fishing, invertebrates, mollusks, ocean fishing, regulations, upland game hunting. Bookmark the permalink.